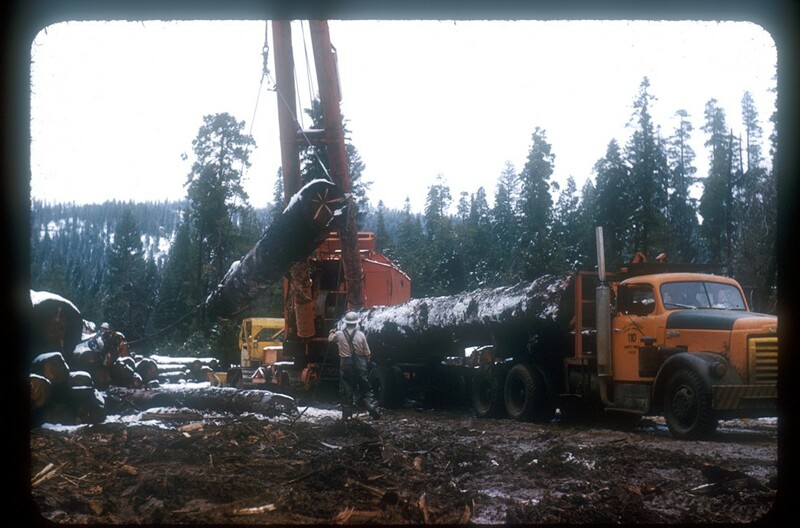 One of Doc’s GMC trucks being loaded with a big log. 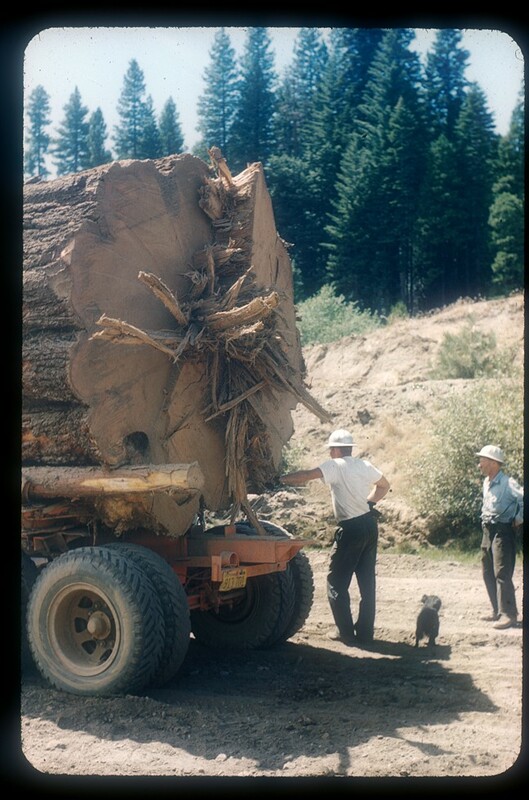 Notice the smaller log being used as a device to enable rolling the big log onto the truck. Roy Armstrong is the crane operator. We don’t know who the other fellows are. This seems like an appropriate time to give a little history about Doc and his equipment. This was first told to us by Rolland Matson, classmate of Bruce Linebaugh at Avery School, and the offspring of one of the most prolific lumbering families in Amador and Calaveras County. Checking Rolland’s memory with Bruce Linebaugh brought some changes to what Rolland had thought he remembered. Rolland, himself, called the next day to say that he had gotten some of the information wrong and it needed to be corrected. 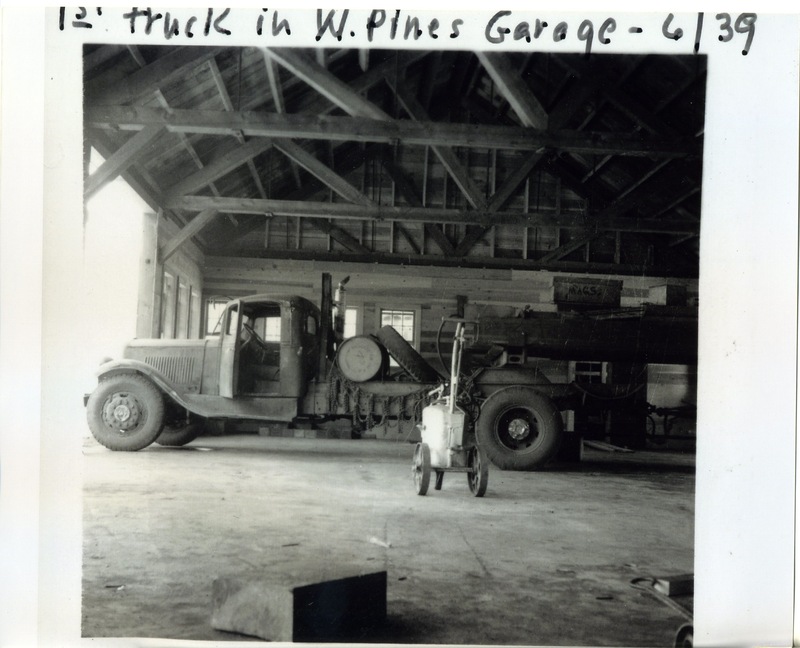 In the part of this web site that tells about Mr. Blagen bringing the mill down from Calpine, the story is told of how Doc moved that mill down to what was to become White Pines. In 1945, shortly after WW II was over, Doc bought a number of military trucks made by White, which were powered by huge Hercules gas motors, which were converted to butane, but these motors were later replaced with GMC diesel motors. Here’s a photo of how these trucks looked in their military dress. In 1951, Doc bought 8 or 10 diesel-powered GMC’s such as the one shown in the photo at the top of this page.As of 2008, one, or perhaps two, of those trucks are still on the road hauling logs. The one that this writer knows of for sure, is still in the famous Linebaugh color scheme, and still looks really good. Even though Doc’s trucks spent a lot , probably most, of the time on dirt roads out in the woods, appearance (of his equipment) always meant a lot to Doc, and he kept his trucks well maintained and looking good. When it came to tractors and other equiment Doc bought Allis Chalmers. Doc never forgave Caterpillar for failing him when he needed them, so instead of Caterpillar yellow, if it was Doc’s, you saw AC orange. In 1958, this Linebaugh truck was parked in Arnold where what was the Texaco station is now the Chevron station. The log is a 7000 board foot Sugar Pine. I’m told that the driver standing near the door is Earl Walsh, and the fellow in the battered hat is Doc Linebaugh. This Mack was one of two that was purchased after Doc had basically gone to the GMC’s. 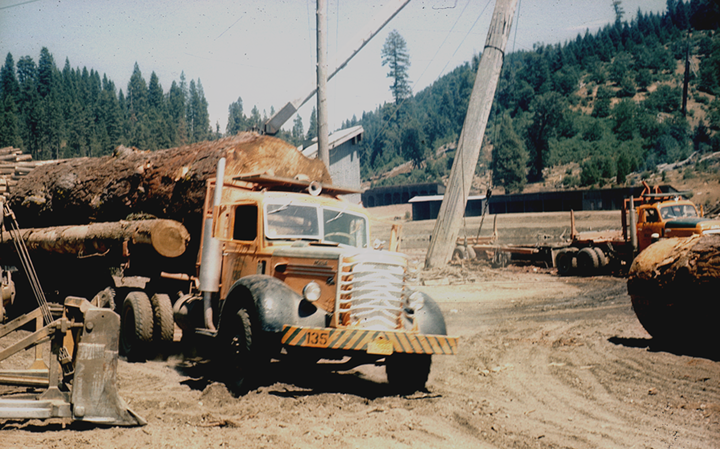 Mack at that time was the premier builder of logging trucks. 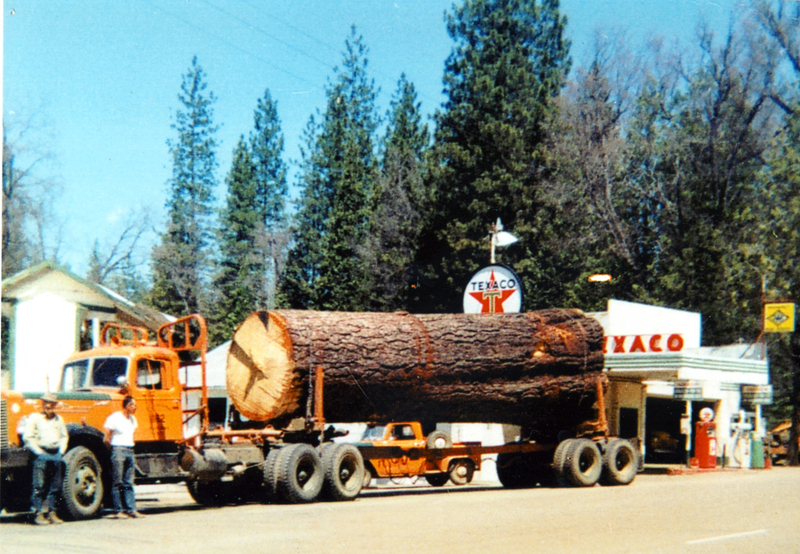 The Peterbilt/Kenworth saga had begun earlier, but at least in this part of the West, Mack seemed to dominate the logging truck choices. This would, of course, change dramatically in a few years, even for Doc, a man with great loyalty. Really big log, probably a yellow pine on one of Doc’s Macks. Russell Leach (on the left) and Harry Bosse using a Disston chainsaw to fall a tree. Very unusual saw compared to other makes at the time. (editor’s opinion) For a time, Disston made saws, like this one, powered by Mercury. They are referred to as Mercury Disston, but you see the two words put together in all kinds of different ways. Mercury/Disston, Mercury-Disston, Disston Mercury, etc. They were heavy saws with large gas tanks. Most fallers apparently believed they were the very best of chainsaws in their time., and were sorry to see them discontinued. That is one heck of a big tree. At the time of this writing, a Google search for Mecury Disston will lead you to a U-tube video of a log being sawn with one of these chain saws. I don’t know of any of us that have old engine building interests or capabilities, but I found your post interesting. I had noticed earlier that complete manuals for the engines, as well as parts are readily available, which you already knew. Send us some photos of the engine work in progress, and of the finished engine. As you have probably noticed, this web site ranges far and wide. We work with a lot of Allis Chalmers Equipment and Parts…this was a great article! Thanks. Glad you asked about Pickering’s trucks. I had no idea of what the answer was, so I asked. He said that Pickering used Peterbilt trucks for the most part. However, in our slide show (in the museum) the trucks pictured in 1958 were Kenworths. They also had some specialty trucks like the Cline that they hoped would pull a double load of logs. Quite interesting and well done.